Cancer is associated with a higher risk of stroke, and in rare cases stroke can be the first manifestation of occult neoplasia. We present the case of a 74-year-old woman hospitalized for ischaemic stroke with multiple cerebral infarctions in several vascular territories. The exclusion of other aetiologies and the simultaneous presence of thromboembolic events in other organs raised the suspicion of a hypercoagulable state, which upon investigation revealed occult neoplasia of the lung. There was rapid deterioration, with recurrent thrombotic events despite anticoagulation, which eventually led to the patient’s death. Levi M. Management of cancer-associated disseminated intravascular coagulation. Thromb Res 2016;140(Suppl 1):S66–70. Wang JY, Zhang GJ, Zhuo SX, Wang K, Hu XP, Zhang H, et al. D-dimer >2.785 μg/ml and multiple infarcts ≥3 vascular territories are two characteristics of identifying cancer-associated ischemic stroke patients. Neurol Res 2018;40:948–954. Dearborn JL, Urrutia VC, Zeiler SR. Stroke and cancer - a complicated relationship. J Neurol Transl Neurosci 2014;2:1039. Lee EJ, Nah HW, Kwon JY, Kang DW, Kwon SU, Kim JS. Ischemic stroke in patients with cancer: is it different from usual strokes? Int J Stroke 2014;9:406–412. Kanaji N, Mizoguchi H, Inoue T, Tadokoro A, Watanabe N, Ishii T, et al. 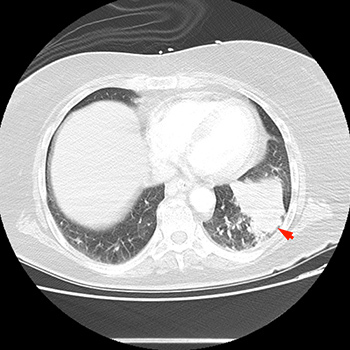 Clinical features of patients with lung cancer accompanied by thromboembolism or disseminated intravascular coagulation. Ther Clin Risk Manag 2018;14:1361–1368.